I think Thanksgiving gets a bum rap. It’s the “middle child” of our major holidays in the US, often outshone by its younger sibling Halloween and older sibling Christmas. I mean, don’t get me wrong, I love Christmas. It’s the most wonderful time of the year. But I also think it can wait its turn. I like Thanksgiving. I’ve got a real soft spot for cranberry sauce, which apparently is only socially acceptable to eat on Thanksgiving. Why don’t we include it in more meals during the year? Thanksgiving. It’s rad. But it doesn’t get the fanfare other holidays get; you don’t decorate your lawn with turkeys or dress up as a scantily clad pilgrim. You do, however, get to hang out with close family/friends, eat a lot of delicious food and get an automatic 4-day weekend. Those are all really great things. So I decided to give Thanksgiving the attention it deserves. As a kid, I loved making decorations for the Thanksgiving table. I thought whoever came up with the idea that your hand could be traced and transformed into a turkey was a genius. I made hand turkeys like they were going out of style – I even colored my fingers look like feathers so it would be more realistic. Since I loved this so much as a kid, why wouldn’t I love the same activity as a so-called adult? 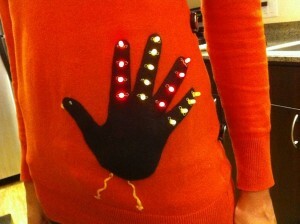 Which is how the idea struck me, and I embarked on my second e-textile project: a LED hand turkey sweater. My first idea was to have the turkey centered on a sweater. But while sweater shopping I discovered that apparently solid color crew necks are ‘sooooo last season’. I then went with plan B and moved the design to the lower-right corner of an orange v-neck sweater I picked up on the cheap. Then it was turkey time! I traced my hand on a piece of brown felt and cut it out. Then, I sewed alternating rows of yellow and red LEDs onto my felt fingers with conductive thread. I then hand-stitched the felt to the sweater, added my batteries and stitched a beak, legs and an eye and….voilà! Needless to say, I was a little proud of how cute it turned out. And this project was much easier than my first e-textiles venture; mostly because sewing to felt is a lot more stable than the previous fabric I used and therefore much easier to keep the positive and negative connections separate. There’s approximately 25 mA of current running through each circuit, but the batteries do last all day. So there you go, Thanksgiving. I hope you feel some much needed holiday love. Here’s the full torso shot, so you can get the full effect. But I warn you, I’m no model (or photographer).